Customers pay a price they can afford which is enough to guarantee the utility a profit. The structure of this bargain required a jurisdiction with the power to make it so; that jurisdiction in this case was of course Berlin. This essential bargain was copied in just about every other jurisdiction in the world that participated in electrification. The first contractual agreement was reached in 1884 between the city [and utility] and incorporated essential categories found in later agreements. Berlin required an income from the utility, and the contract specified that 10 percent of the utility’s gross income and 25 percent of its annual net profit would go to the city. What did the private company receive? In essence, the city conceded a monopoly on an inner-city area with a radius, centered on the Werdersch Market, of about half a mile. This is how engineered electricity, which I have called the greatest social equalizing force in history, became the… greatest social equalizing force in history. Engineered electricity, by which I mean the electric grid, is hugely capital intensive. For this reason, the only way to equitably bring it to the masses is to make it affordable to the poorest of the masses, and the only way to accomplish that is to allow the company that makes it to utilize economies of scale. Without that scale, the business model underpinning the modern grid cannot work. Neither objective—affordable prices for consumers and profits for the utility—can be achieved. Today, we in the developed world cannot imagine life without engineered electricity. Most of us grew up with the grid. We are among the very first generations of humans who have at our beck and call a “workforce” of such magnitude and reliability. A small everyday example: it took my coffeemaker seven minutes to brew two cups, roughly 750 mililitess, of coffee. During those 7 minutes, the device was using roughly a kilowatt, one thousand watts, of power. Now, get on a bike, a stationary bike or an actual moving one, and pedal as hard as you can. Try holding your maximum sprint rate for say one minute. If you are an “average” person, you were putting 200 to 300 watts into the crank on the bike. That was one minute. The elite cyclist Michael Rogers, on his first big climb in the 2014 Tour de France, held a power output of 445 watts for eleven minutes and 23 seconds. My coffeemaker cranked out more than twice Rogers’s wattage, yes for a shorter duration but that was only because I wanted only two cups of coffee. If I had company and she wanted two cups too, for the coffeemaker, no problem. It would just crank out a thousand watts for as long as it took to heat four cups of water to the right temperature. No offence to Michael Rogers—he is a fearsome athlete. Putting out 445 watts over eleven minutes, that is amazing. There is no way I could do that. But in the world of physical power, Rogers is only human. He dwarfs and outweighs my 1.6-kilogram coffeemaker, but this puny appliance easily outworks him. That is because it is connected to the electric grid. If I wanted to make a couple cups of coffee using human power, i.e. to somehow utilize the power output of a Michael Rogers to heat my coffee water and pump it up to a drip filter, I would need three or four Michael Rogerses. How could I possibly persuade three or four superbly conditioned athletes to spend part of their day in intense backbreaking labour making my coffee? What glory—the essential motivation for an athlete—is in it for them? None. If I really wanted them to expend that much effort on my behalf, well I would have to pay them a lot of money or arrange society so that people like them simply obeyed people like me. That was actually the way some societies were in certain parts of the world, back when the City of Berlin granted the monopoly to Deutsche Edison Gesellschaft to serve an urban area with a diameter of roughly 1.6 kilometers with electricity. That was the way things were in the American south only 20 years prior to the Berlin agreement, and it was the way things were (legally at least) in Brazil for five years following it. If you were lucky enough to be in the tiny minority of people who owned other people, you got those people you owned, slaves, to do your heavy work. I’m not sure I believe in the irreversibility of human progress. In fact, knowing what I know about human history, including very recent history and right up to the present, I think we live in a perpetual state of easy reversibility. But unless there is some cataclysm that changes everything, I think we, the developed world, which I hope keeps expanding and does not contract, will not revert back to slavery for the foreseeable future. As long as we have a viable electricity grid. RWE [the biggest German utility], which heavily relies on coal-fired power plants, warned the [watered down federal plan] would lead to the immediate closure of its lignite-fired power plants. If you didn’t think quickly enough, you might laugh at that threat and tell RWE so what, go ahead. But if RWE really did shut down its lignite plants, Germany would be plunged into an economic and social crisis similar to the one it suffered following the Second World War. That peacetime crisis was defined by shortage, and especially shortage of energy, and if RWE made good on its threat there would be another massive shortage of energy. And all the wind and solar installations that have been built in Germany over the past 15 years cannot possibly make up for the disappearance of lignite-fired power. 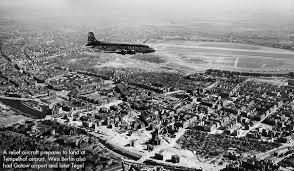 The Berlin Airlift. Try to guess: what was the Number One item flown into Berlin over the year and a half of the operation? The answer: coal. Berlin gets cold in the winter. All that post-industrialist talk of the green economy would suddenly stop as fantasy collided with the Iron Rule of Power Generation. The Iron Rule, in this latest formulation on this blog, says: only reliable sources can provide the electricity that drives a society. Barring an unforeseen technological failure, those sources will never be allowed to stop providing electricity, unless another source of equal reliability takes their place. Even if carbon emissions go up? Yes, unless Germany finds a way to make reliable, on-demand electricity with no carbon emissions. The Iron Rule was borne, after all, from the 1884 agreement between Berlin and the electric utility. The grid, or at least the social bargain by which the grid became viable, was born in Germany. RWE was in 2011 ordered by the allegedly carbon-conscious German government to shut down its fleet of nuclear power stations. If the nuclear phaseout actually happens (only part of the nuclear fleet is currently out of service), then there goes a significant chunk of reliable power capacity. Because of the Iron Rule, RWE has ramped up production from its lignite plants to make up for the loss of output from the shut-down nuclear stations. And now the federal government is telling the country’s biggest power producer to cut back on lignite. The government has broken the social bargain that made engineered electricity, the greatest social equalizing force in history, ubiquitous. No wonder RWE is exasperated. Great post, as usual. Thanks. Thank you for that interesting piece of history and another well reasoned article. Society gives me the impression that most folks have no perspective on what life was like in the past and the wondrous historical achievements that gave us the civilization we enjoy today. They’d throw away the foundations of society without checking to see what those foundations were supporting. Or, in other words, more folks need a history of science/technology education. These pols exhibit what can only be called cargo-cult thinking; if they make the right gestures, Green energy will fall from the sky. It’s a pity that we can’t tell them to go ahead and lash together their control towers from local bamboo, and see how many planes-full of cargo they receive for their efforts. Engineers and scientists ought to stand united to tell the ignorantia politica to shut up and listen to the experts, because there’s no way we’re going to escape grief with any pursuit of delusional schemes. Quite right. There’s no way that *we* are going to escape grief, but the ignoratia politica are confident that *they* will escape. That explains everything. Good to see you back with more creative posts Steve. It makes me think of Japan who must have realized the importance of nuclear power. Did the Japanese utilities do such a good job of replacing the power of 48 shut down nuclear plants that the public never noticed the effects of losing abundant power? You would think that in the face of hardship versus the comforts of reliable power that the reliable power would win? This is happening in Germany too. I would think Germany was better prepared for reactors going offline but they could all benefit from reading this post. Thanks Steven. The public noticed the hardship in Japan, but they thought it was what they had to suffer in order to replace nuclear, and also that it was the fault of nuclear that they had to suffer it. What’s more the hardship was reduced by the fact nuclear was only one third of the generation capacity, and a lot of it could be replaced by running the diesel oil peaking power plant constantly. Thus Japan became by a strong margin the world number one user of oil for electricity production, in front of Saoudi Arabia.